Men sweating, blades singing, blood, screams and flying limbs...your band is broken you just have seen the captain fall. You are in charge now. This is how Battle Brothers starts. 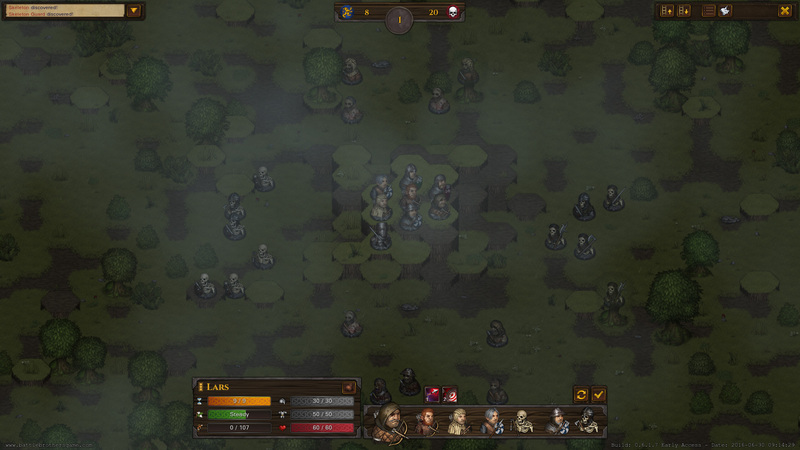 You barely manage to get away from the last battle with nothing more than three men, some money and few provisions. But you are not desperate, being the experienced mercenaries you are you know the company can be rebuild. And you will have to...or die. When you arrive into a town you will be able to visit few different locations including smith, market, chapel, tavern, volunteers and few others, but the ones mentioned are the ones you will visit most and find in most towns. I am sure you can imagine what most of those are used for, so I will tell you more about the one where you will find yourself often - volunteers. In each town depending on its size mainly you will find different kind and number of men who have decided that the life of a mercenary is better than whatever they have been doing. Each volunteer has price, upkeep cost and biography. The biography is always the same for all men of a single type(all farmhands will have the same biography.) so it is not really that useful when you are hiring someone. All in all is a wild guess what abilities the man you are hiring will have(they can even have disadvantages like tiring quickly or eating more), but you still can guess some things. For example a trader is not very good in the shieldwall as he is weak. A priest will not flee easily, because of his hard resolve, but he is not used to fighting etc. In bigger settlements you will find better man. Some of them will come with good equipment or will even have few levels under their belt, but they will cost a lot more. The more men you have the more money you will need to pay them and more food you will need while on the road. The maximum size of your company is 20 men, but you will find yourself expanding slowly because of the scarce resources you have and the fact that you will lose men from time to time. And while it is easy to just go hire 1-2 new guys and put on them the equipment of their dead comrades you will notice that guys who are 4-5th level are a lot more useful than inexperienced new recruits. Not to mention that the game scales to really high levels of difficulty and you will need to train different men into different things so they can take on different roles on the battlefield. Making characters "specialize" so to say will make losing characters at later stages even harder to compensate for. It is kind of the Darkest Dungeon case where each level of a character make him/her more and more valuable and irreplaceable. And little by little we get to the main attraction - battles. In battle as in the whole game your characters are represented by cute pawns, but that is pretty much all the cuteness you will see in this game. The battles are turned based and take place on hexagonal battlefields ridden with terrain obstacles which you will have to take in consideration during battle. Those include different terrain height which will affect damage and hit rating; trees which will block line of sight and even tall grass which is able to fully hide enemies and allies alike. But the things to keep in mind continue. Against different opponents different tactics work. If your enemies are undead or wild beasts pike wall is great. If they are humans you will have to advance as they will not throw themselves at the spears. Also when you are against armored opponents certain weapons work better etc. Also during battle you need to keep an eye on your brothers's resolve as if it drops they might flee. Many things affet resolve - being surrounded, seeing ally fall, seeing some being incapacitated. 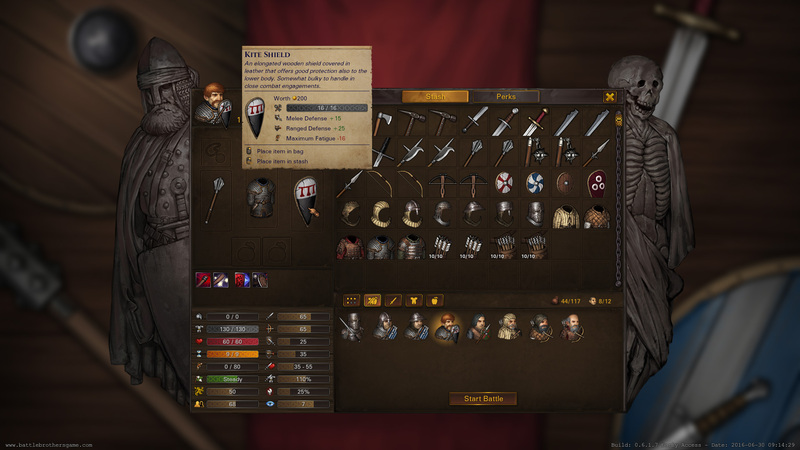 You can even, no you will have to use formations and specialize troops to do different roles during battle. Or in other words the battles are complicated and will need deep strategizing if you want to win. Not to mention there are also crisis which when happen enemies become more numerous and start to raid cities and caravans. Making a well armed and skilled party very important if you want to survive the crisis. Battle Borthers is ok looking game. No flashy effects, no high detailed models, nothing visually impressive. But oh my how deep is this game! You will have to manage your company, be careful what brothers you hire, to have enough money, food and supplies. Which brothers you will take to battle, who will you hire, how will you arm them, what formation you will use. There is a ton of things, ridiculous amount of depth. The biggest downside for me was the lack of overarching story, but you can easily make your own. You will meet enough strong enemies, you will have more than enough epic battles to do so if you want to. You will even have the chance to get into a war between the royal families. Plenty of material to make your own story. Another nitpick which might turn people away is the low fantasy profile of the game. 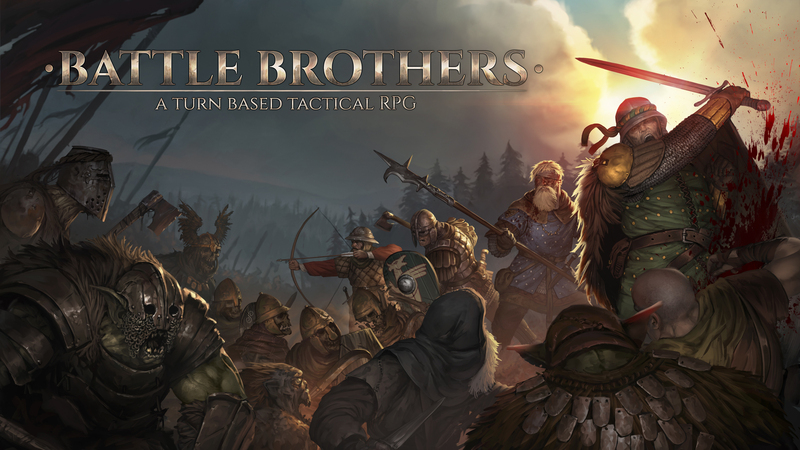 You will fight orcs, goblins and undead, but there is very little magic in the world of Battle Brothers. 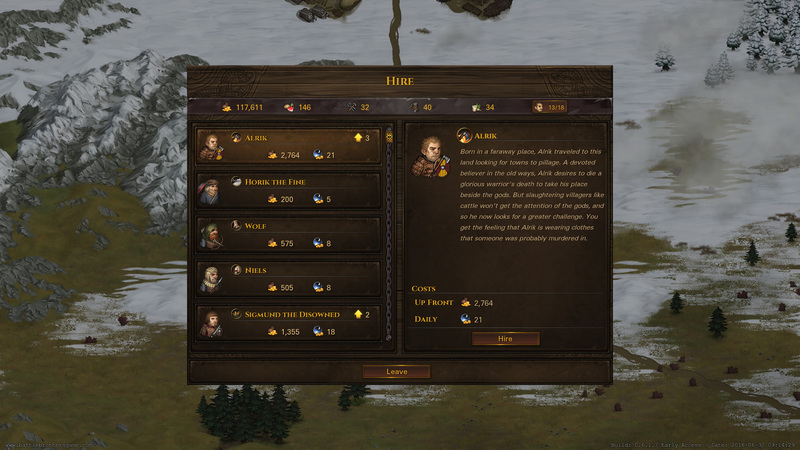 If I have to compare Battle Brothers to another game it is definitely Mount and Blade with bigger focus on the fights and turn-based, but similar in many ways. Great, sadly niche game which will not get the attention it deserves. It is hard, it is far from casual and takes a lot of time to progress. But great, great game nonetheless. Публикувано от Sharki в 8:29 ч.